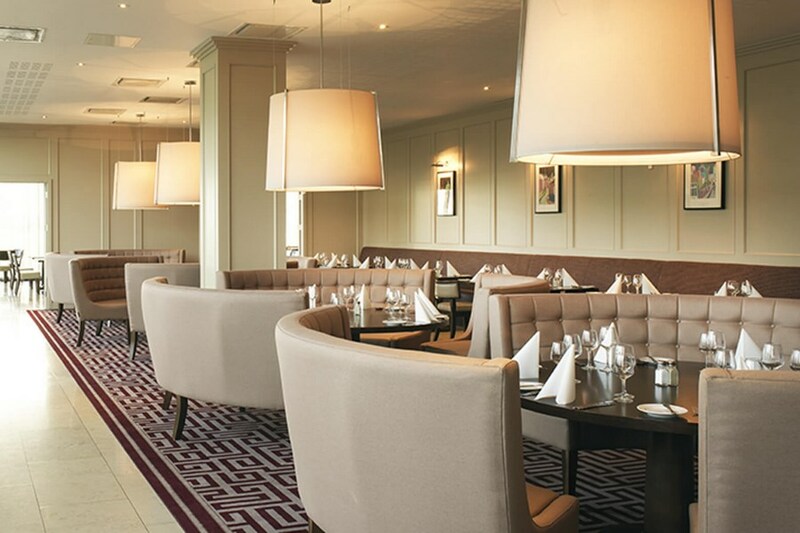 The Clayton Hotel Leopardstown Hotel Leopardstown) is located in the Leopardstown area of Dublin. It is near to the Sandyford Industrial Estate, Leopardstown racecourse and Dundrum shopping. The Hotel is also just a 15 min walk from the Luas line which will give u access to Dublin city centre. 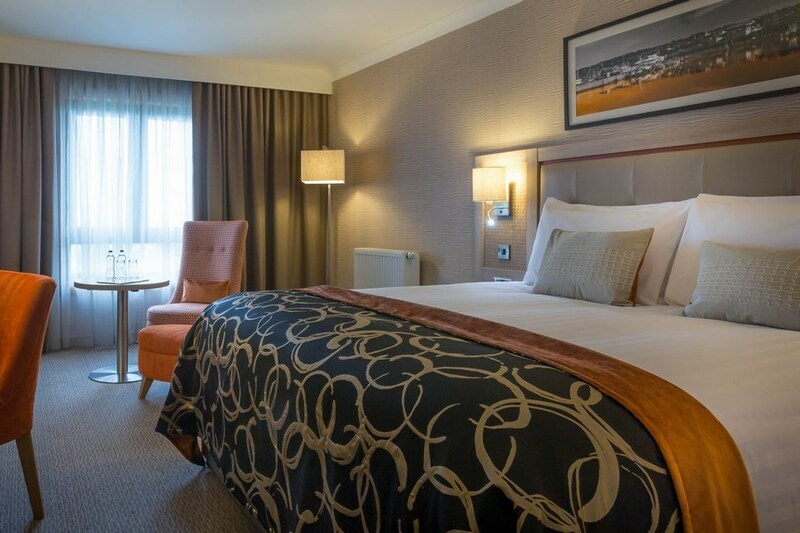 Adjacent to Sandyford Industrial Estate and Business Parks and within walking distance of the Luas giving easy access to Dundrum Shopping Centre and Dublin City centre, Leopardstown racecourse is only a 5 min walk from the hotel. Hotel good, notwithstanding room over-furnished with beds and thus lacking space (3No.double beds - 1No.foldout - for 2No.guests). Breakfast fair. Selection of fruit limited, and that of bread very limited. Seating tended to be mostly in corner nearest staff station, and tables for two very close together. Table settings very basic with cutlery limited to minimum. Tea / coffee ordered as guest seated & served very soon thereafter. Result was that hot drink cooled as cereal procured from self service area and subsequently consumed. By the time hot breakfast procured, hot drink cold. (To solve, waiting staff require a little better tact and timing in requesting orders). We stayed in hotel for one night... Our overall experience was good, food was nice, rooms good size and clean.. The biggest minus was the first impression when we walked into hotel and went to reception. We were really looking forward to have a great time, but receptionist didn't even smiled for once and there was no welcome what so ever. We had dinner included in our package and the man giving us the voucher, didn't say that we should book a table in restaurant, as a result we had to wait for table, hotel was busy enough,but restaurant staff was far nicer than the gentleman at the reception. He didn't point out where is the restaurant or bar. That made us feel unwelcome, but everything else was fine. Although the hotel is under some construction this had no impact on our stay for one night. We had a very enjoyable stay. The meal was lovely and the buffet breakfast in the morning was everything you'd expect. We stayed here as a family of 10 for 1 night. There was a small glitch with rooms which was dealt with very quickly and courteously and all was well. The staff at breakfast were friendly, helpful and pleasant. Rooms were warm,clean, comfortable and quiet. Our stay was very pleasant. We stayed for two nights, Friday and Saturday, we enjoyed our stay. Very clean, comfortable and well run hotel. We feel we got good value for money, breakfast was great with lots of options and the dining area was large so not too packed. All the staff we dealt with were helpful and professional. 2-day stay. (a) Toilet rolls & shampoos / bodywash (miniture bottles) not replenished after day no.1. (b) Shampoo dispenser in Shower / Bath unit empty throughout stay. (c) Clerk on desk tried (presumably unintentionally) to overcharge us on checking out. Breakfast good. Hotel ambience very nice. A little difficult to reach by car, but o'k with practice. Would be good value, except for a, b & c above. This is a great little hotel. Staff are friendly, rooms are good, breakfast is very impressive, so much choice. Luas right next to it and a short taxi ride to city centre. EXCELLENT VALUE. SUPER BREAKFAST.COMPLIMENTARY FREE PARKING.OVERALL AN EXCELLENT STAY. my husband and I stayed on Sat 12th Dec. Check in staff very efficient and nice. room very spacious, looked newly painted. Everything very clean and comfortable. Dinner was included in our deal and the restaurant staff were v friendly. food was delicious and breakfast was excellent...much better than it used to be when it was a Bewley's Hotel. All in all we had a lovely trip and would definitely stay again . Charged two times to my Card (only discovered this after stay). Be warned you will have to pay for parking which will be an additional 15e per night. Ordered pizza to room in the evening and it was extremely hard and dry. In fairness the rooms are grand but beware of hidden add ons. Friendly staff too. Very pleasant stay. Location is perfect for easy access to city centre. Luas is very near the hotel so no need to drive and find car parking. The only minus is the price of drinks. A bit pricey even by hotel standards. Would have no hesitation recommending this hotel. It is obvious that the new owners are anxious to impress us old patrons with their attention to detail. Fortunately there is very little that needs tweaking. The hotel never rested on its laurels or it's assets, location, location, within 150 metres to Luas which permits you to leave your car behind if you wish, and Terminus to the Blue Bus to the airport which can be boarded at any hour of the night/morning without getting wet or blown away. We have always liked it very much for it's efficiency, courtesy and good value. Just had three great nights there. 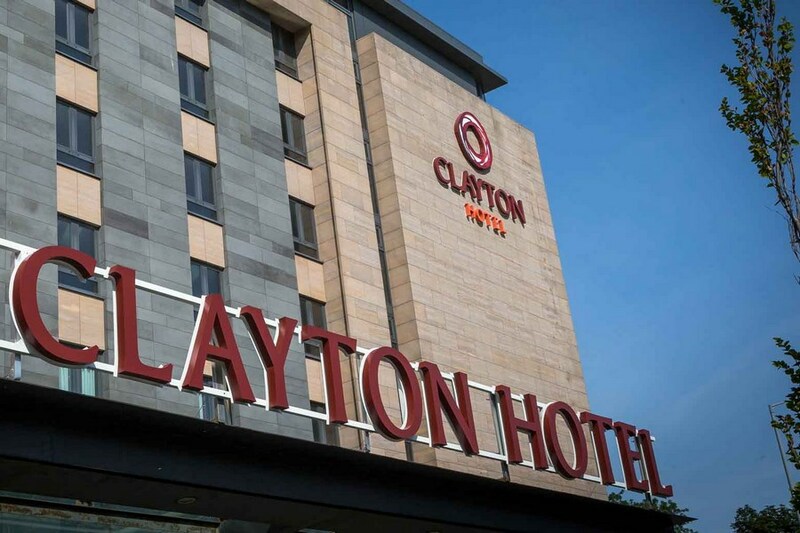 Deserves the fourth star..
great location for anyone travelling from the country, easy to find off the M50 and luas stop outside hotel so no need to take car into town.basic enough hotel but for the price i paid very good value.comfy bed good shower great breakfast. Dinner average enough but would definetely stay here again due to the location and value for money. Family of 4. Stayed for 1 night. Perfect for our needs. Nice clean room with wifi. Lovely breakfast selection- one of the best I've had. Will stay again. Great value for money. Rooms clean and comfortable. Breakfast good. Have stayed here many times before and always found it reasonable and would rate it 5 star, This time though the experience wasn't positive - the room was excessively hot even though I turned the heat off at 3pm on check in. The lobby and bar were excessively loud so there was no where to go to get out of the heat and relax. The noise from the road outside just added to the mix and eventhough we eventually got a fan for our room our sleep was distrurbed and limited. I would normally rate this high for a good family stay but not this time. On the plus the breakfast was nice. Customer service & facilities excellent at this hotel. I would have no hesitation in recommending this hotel to anyone, especially at its handy location for South Dublin and its competitive rates. Very enjoyable stay. Reception staff extremely friendly and helpful. Family room is a great size. Kids enjoyed it. Great location for shopping in Dundrum. Will be back!! Amazing Hotel, Food was 1st class and the service! Would highly reccomend and also had a child with us and was great for him to. Will stay again in the future. We stayed in Bewleys Hotel Leopardstown on the 18th April. The room was nice and clean, bed very comfortable, breakfast was nice but could have been hotter, it would have helped if the plates were kept hot. Staff and service was very good. We were very disappointed when we had to pay for car parking, in other hotels its free. But we will go back again. M. A. The hotel was clean. The bed was comfortable .The breakfast was cold.! The plates were very cold to start. and the method of keeping the food hot needs to really improve.! I felt I couldn't send it back to the kitchen to be microwaved . (This tends to upset the chef !!) On the Saturday night that we stayed,the bar resembled a creche right up until the time we left it and this was past midnight.! great price, super value. The staff were friendly and very professional. Hi we enjoyed our stay very good value for money, we would have liked some entertainment on the night as it was a bit boring in the bar, we would go back again as we did enjoy our own company,and the food and service was good. We stayed here October 14. It was a total nightmare. Our room was dirty, we needed extra pillows, the bed linen was torn, the mattress of the 'sofa bed' was torn, there were black marker stains on the towels. Despite notifying the reception staff on numerous occasions, none of the issues were rectified. We had 2 meals in the restaurant - the food was cold and was sent back only to be re-heated. On our second evening the occupants of the rooms adjacent to ours ordered take aways, pizza, chinese and when they were finished with their food, they left their trays/take away cartons outside their rooms on the ground. The following day when we were checking out, all trays remained on the floor, along with empty glasses and wine bottles. It was disgusting. Cleanliness in the hotel is not paramount. Really didn't enjoy our stay there and definitely won't be returning. Not good value for money. I was very pleased with the hotel, the staff were so helpful and nice, food was excellent, my one complaint (and to me it is a very big drawback) is that a guest has to pay for parking, this seems to me that the guest is completely at the mercy of the hotel as few of us arrive on foot. Great hotel used for accessing m50, easy Access to so much. Two adults and two children. Rooms comfortable. Food was good and catered was coeliac friendly.